All three of my children love to build and create with arts and craft kits, however I always dread the messy clean up when they are done. We have recently discovered a new toy line of constructive play kits from PomTree that reduces mess because there is no glue required! PomTree provides hours of creative fun as children can create a variety of crafts and building projects in the new PomTree Stuck On Fun™ product line. 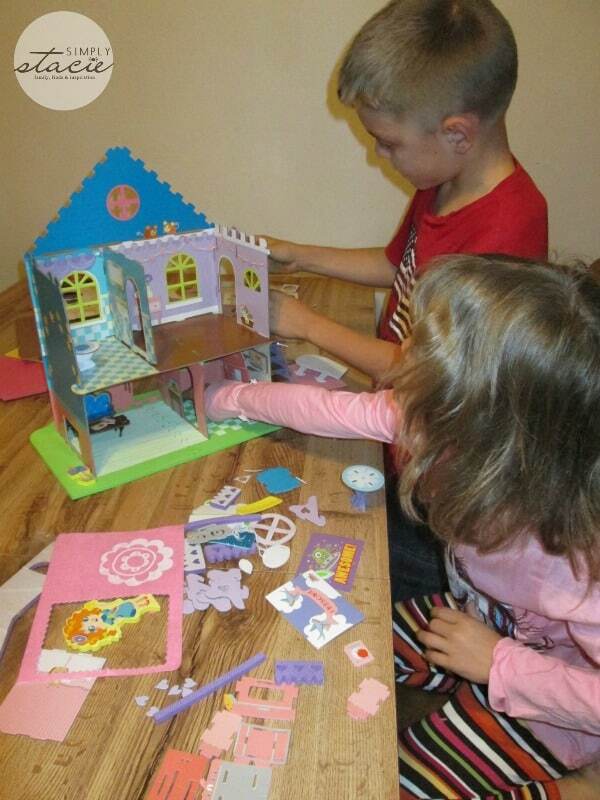 With imaginative constructive play kits such as Our Day On The Town Sticker Storybook, Twinkle Top Treehouse and the Sparkle Fun Playhouse there is sure to be something fun and exciting for boys and girls ages 3 and up. I appreciate that PomTree Stuck On Fun™ kits are affordably priced from $5.99 to $19.99 each without sacrificing on quality and entertainment value. Each product in the craft kit line features high quality materials such as foam, felt and stickers. 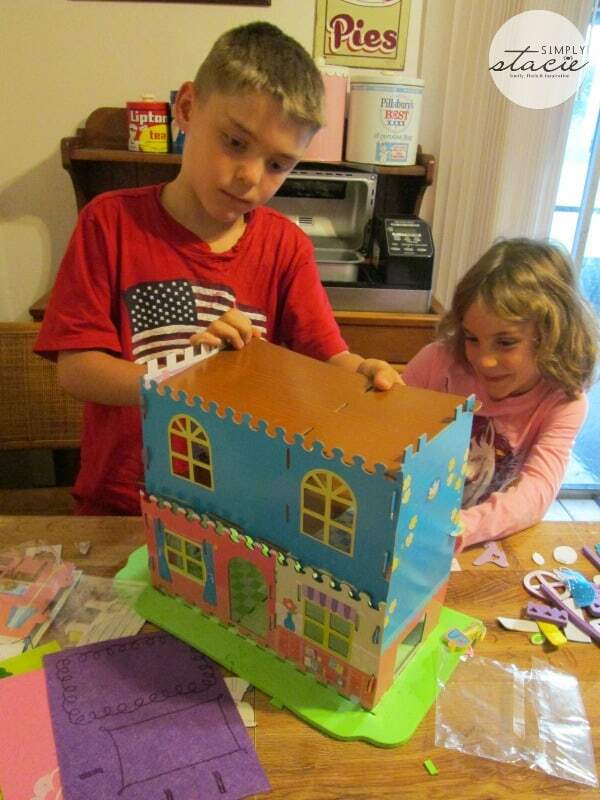 The play kits include easy to follow instructions and my eldest eight year old son was able to lead the project spending over an hour at a time interacting, playing and creating with his two younger siblings who are ages 7 and 6. My daughter’s face lit up with excitement when she saw the PomTree Sparkle Fun Playhouse ($19.99) which is a huge 3-D Playtown! It features a whopping 402 pieces and the finished project stands 15 1/2 inches tall so that it can be displayed proudly and played with again and again. 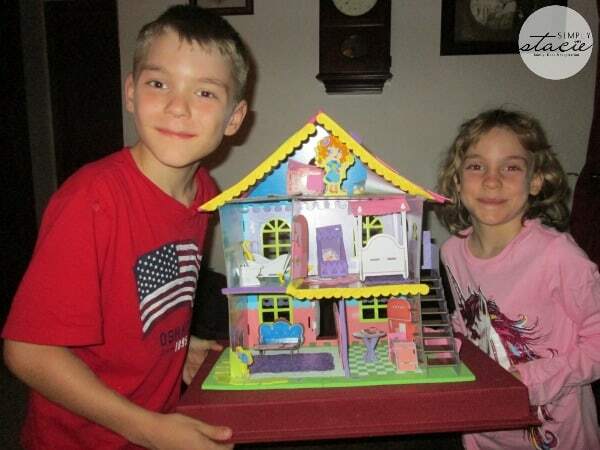 It includes not only a playhouse but lots of furniture, decorations and accessories such as bushes, pets, characters etc. My children had so much fun working together to build and play with this set and the pieces are easy to manipulate into place and are surprisingly durable. I love that I can add to the PomTree Playtown with the Twinkle Top Treehouse, Feathered Friends Post Office, Sunnyside Up Market, Swing-A-Long Pet Playset and the Over the Moon Creamery. 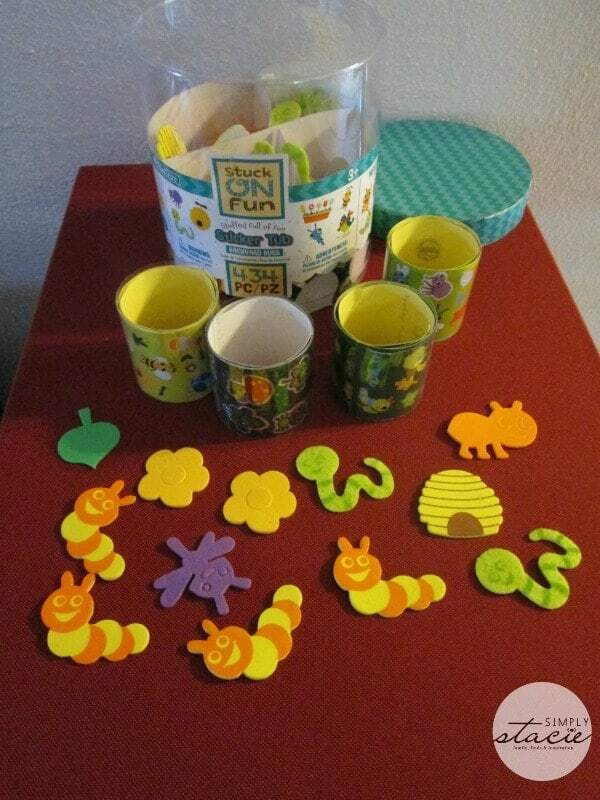 The PomTree Stuck On Fun™ Sticker Tub Backyard Bugs includes 434 pieces and is wonderful for open ended imaginative play. 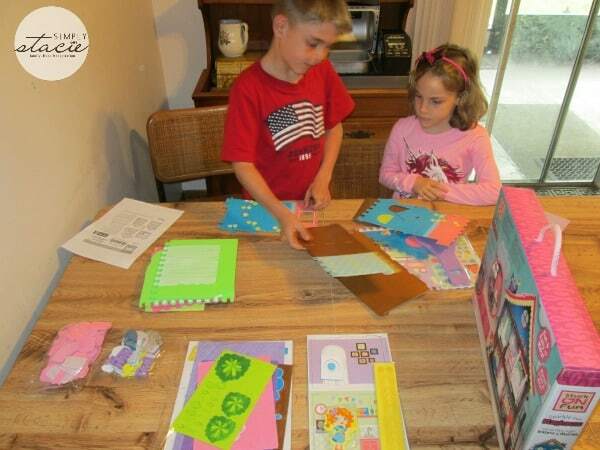 Children can create from a wide variety of projects using the foam, felt, paper and mixed media stickers. My children had a great time making greetings cards to send to friends and family, posters for their room and even a report for their homeschool co-op class presentation. 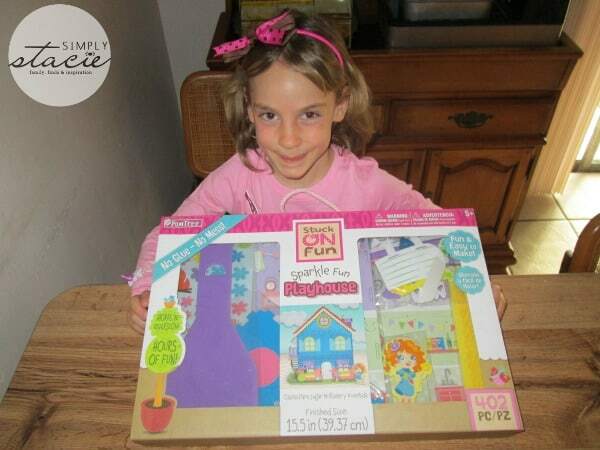 PomTree Stuck On Fun™ Constructive Play Kits are great gift ideas and tons of fun for children of all ages. You can purchase PomTree make-and-play products at specialty stores including Jo-Ann Fabric and Craft Stores, Meijer and Barnes & Noble. my daughter would like our day on the town sticker storybook. They would love the Large Sticker Tub! I think the Home Décor Sticker Bucket is great. My niece would love the Swing-A-Long Pet Playset! I think they’d enjoy the Twinkle Top Treehouse.